Charming fragrant blends of sunny bright floral mixed with a touch of green leaves. Renew your skin with nature's best moisturizer, sunflower oil. 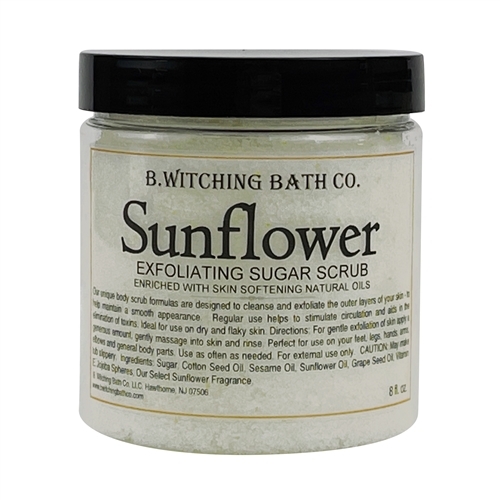 The perfect scrub for shower or bath, our non-greasy, gently exfoliating formula smoothes skin with nourishing oils, including jojoba oil, sunflower seed oil, safflower seed oil and mineral oil, for maximum hydration. The gentle formula may be used anytime, even after shaving. Leaves skin soft and lightly scented with our natural fragrance. 8 fl. oz. Distilled Spring Water, Isoprpoyl Myristate, Cetearyl Alcohol, Cetearath 20, Caprylic/Capric Glycerides, Dimethicone, Stearyl Alcohol, Soybean Oil, Shea Butter, Sunflower Oil, Soya Oil, Disodium EDTA, Diazolidinyl Urea, Benzophenone4, Iodopropynyl Butylcarbamate. I don't use lotion on my legs in the Summer. 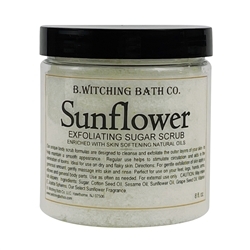 I use this amazing sugar scrub. Try it!